This communication reports on the results of a web accessibility audit of public Web sites in Greece. The audit was conducted in 2008 by the Human Computer Interaction Laboratory of the Institute of Computer Science of FORTH, in its capacity as the Greek National Contact Centre of the European Design for All e-Accessibility Network. 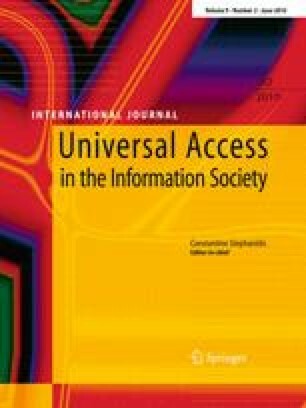 In an earlier e-Accessibility study in 2004, that evaluated approximately 250 public and commercial Web sites in Greece, 73% of the sample failed to meet the most basic requirements for web accessibility (http://www.infosoc.gr/NR/rdonlyres/0B306F9C-A819-4F96-ABB1-A21945D1D2B3/1092/final_report.pdf). Four years later, in the context of a re-audit, a similar sample was examined for compliance with the same web accessibility standard (WCAG 1.0), as set by the Web Accessibility Initiative of the World Wide Web Consortium. The accessibility checks were conducted during the period from March to September 2008. A comparison of the results indicates that although new web development technologies may have been employed, instead of improving the overall status of e-accessibility, this has resulted in a serious deterioration in overall accessibility levels. Such findings—85% of sites failed to comply with Level A—suggest that Greek Web sites are likely to present even more significant access barriers to people with disability than in the past. As Web Accessibility is poorly understood and, until today, new platforms have failed to deliver products that conform to WCAG, the need emerges for a concrete legislative framework to set accessibility specifications for all public Web sites in Greece.